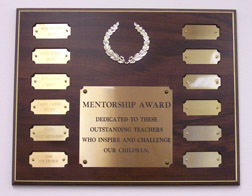 SWSF’s annual Excellence in Teaching: Mentorship Award recognizes teachers, principals and other school-based staff who exemplify the kind of commitment to children that creates exceptional results. A commitment of $10,000 over three (3) years was made to establish the Endowment, with the hope that future gifts by interested community members will perpetuate the award and allow for additional honorees each year. Candidates for the award will be nominated annually by members of the senior class (may be from any campus in the district) and reviewed and selected by a committee established by the Board of Directors of the Foundation. 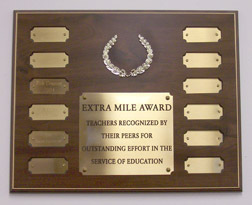 SWSF’s annual Extra Mile Award was created by an anonymous donor, and recognizes extra efforts by a teacher. This award, with its accompanying $500 stipend, is presented to a teacher selected by the Foundation from nominations by his or her peers for efforts beyond the call of duty in the past year. Donations enable this award to be endowed for several years at this amount.